I know that I said I’d post on this blog over the summer. I had good intentions… but… that didn’t work out so well. My apologies. Regardless… welcome to the new look and feel for BreathingAsAFamily.org. I have consolidated all of my blogs on wordpress. I was hosting things on blogger, but, after much deliberation, I decided to switch. I’ll write about the switch and my reasons for doing so on my sister blog, wirepaper.com, in the near future. Check there if you’re interested in some geek reading. And welcome to Fall 2010! I know it’s not “calendar fall” yet, but, with school back in, it certainly feels like summer is over. 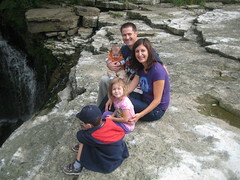 Yesterday, we marked the end of the summer by going on a hike to Ball’s Falls in Vineland, Ontario. We had a great time. And, we got some great pictures as well. As you can see from the picture posted here, Riley has now officially participated in his first “high risk activity” by sitting close to the edge of Ball’s Falls. “Cystic Diagnosis” – what should be in a “handbook for families new to CF”? So, check back often. It should be a fun fall/winter. I hope to post a couple of entries a week through the fall and winter. ‹ We’ll be back shortly – check back later this summer for new content!